In 2018, the 100 Thieves became the newest organization to represent North America at the League of Legends World Championship. 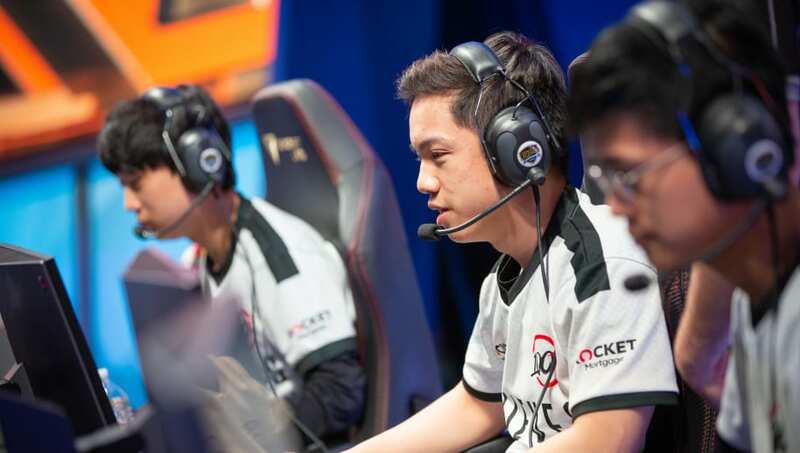 New to League of Legends, 100 Thieves joined the League of Legends Championship Series (LCS) as part of the switch to franchising and assuaged doubts that a newcomer from the Call of Duty world could replicate success in the MOBA field. With a second place finish in the spring split and fourth in the summer, the Thieves had an acceptable showing at worlds in a group that contained the two finalists, Fnatic, and Invictus Gaming, and with substitute Richard "Rikara" Samuel Oh in the Bot Lane position. Despite dissatisfaction surrounding the team's decision to bench Cody "Cody Sun" Sun, the 100 Thieves' revamped roster that included two-time world champion Jun-sik "Bang" Bae of SK Telecom T1 fame smoothed over much of the discontent. Please welcome Bang @JunSikJjang123 to 100 Thieves. Now, a few months down the line and with a major rebuild that in theory revamped the roster, the discontent and doubts have returned in full as the 100 Thieves stare down the barrel of a last-place finish in the spring split. With only two matches against Counter Logic Gaming and OpTic Gaming to save them from that embarrassing ending, 100 Thieves can't help but wonder how they ended up in this position. In theory, continuing with the 2018 core with new pieces should've seen the Thieves maintain a similar position with guaranteed playoffs and contention for the title. Even with other teams such as the Golden Guardians and FlyQuest revamping their lineups, the 100 Thieves roster should have stayed far ahead of last place purely off star power alone. Chan-ho "Ssumday" Kim in top lane. Andy "Anda" Hoang in the jungle. Jae-hyun "Huhi" Choi in the mid lane. Bang and Zaqueri "Aphromoo" Black in the bot lane. Individually, they're all accomplished veterans or promising talent. Together, they're the biggest flop in the LCS post-franchising. Here's your 2019 #LCS Spring Split standings at the end of week 9. The balance of the team should be fine, with carrying power in the top and bot lane and a mid laner and jungle that only needs to hold stable. But instead, the Thieves seem to consistently lose across the map and slowly get shoved backward until they lose. In some cases, a losing team should hold together for longer to see if they can still bring it back. This is not one of those cases. The obvious target for removal is Huhi. Ignoring UI blunders like the missed teleport, he has consistently faltered in holding down his lane, never mind winning it, and seems unable to generate side-lane pressure or team-fight threat during matches. With his move to the Academy team, it seems the transition is already being made, but Max "Soligo" Soong is not much of an improvement. Despite the concentrated vitriol (both deserved and undeserved) towards team captain Aphromoo, he has demonstrated enough past excellence and bounce-back ability to inspire confidence for the future. Bang is a stable presence whose power best shines in the late-game, and Ssumday can be relied on to maintain his lane. Anda shows promise for future growth, but seems to lack in-game knowledge. It would be in the Thieves' best interest to explore alternate possibilities to provide more shotcalling and direction in the top half of the map. While they previously removed William "Meteos" Hartman, it's possible nabbing the other Optic jungler in Joshua "Dardoch" Hartnett would aid them moving forward. Despite the fervor surrounding the Thieves, things aren't as bad as they could be. While it's true that there are few positives in last place, the organization still maintains and manages itself well and has shown willingness to make the moves needed to strengthen its team. As for the players themselves, this is not a lineup beyond salvaging. With a few trades and roster swaps, there is still a possibility in the remaining pieces. However, as it stands, this five is done. And even with the web of contracts spun around them, the Thieves unarguably need to make changes going into summer.